A Parliamentary survey in 1776 reported that workhouses were in operation in Oswestry Parish (for 30 inmates), Oswestry Town (30) and Whittington (20). The success of the Shrewsbury Incorporation, formed in 1784, led to the formation of a number of other such Incorprations in the area, including Atcham, Ellesmere, Whitchurch, and Montgomery and Pool. In 1791, Oswestry Hundred and the parishes of Chirk and Llansilin were incorporated under a local Act for the better Relief and Employment of the Poor (31 Geo. 3. c.24). This gave it the power, amongst other things, to erect a workhouse which it did soon afterwards at a site at Morda. The Incorporation's local Act status made it immune from many of the provisions of the 1834 Poor Law Amendment Act and it maintained its independence until the end of the workhouse system in 1930. The Incorporation's member parishes were: Chirk, Kinnerley, Knockin, Llansilin, Llanymynech, Llanyblodeell, Oswestry Parish, Oswestry Town and Liberties, Ruyton of the Eleven Towns, St Martin, Selattyn, Soughton or or Sychtyn, West Felton, and Whittington. Weston Rhyn joined the Incorporation in 1897. 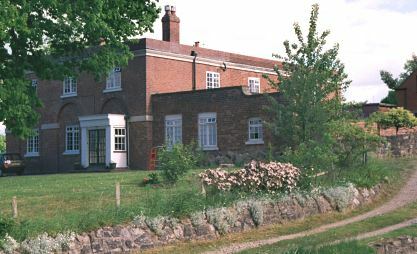 The Incorporation continued to use the workhouse at Morda. Its location and layout are shown on the 1901 map below. The main workhouse was a substantial three-storey building which accommodated up to 300 inmates. Oswestry main building south-west wing from the north, date unknown. 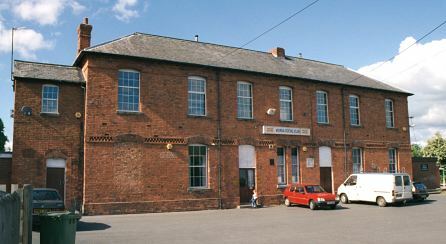 The main workhouse building was destroyed in a fire in 1982. The only surviving part is a two-storey section at the west which has been incorporated into a house. Oswestry from the north-west, 2001. 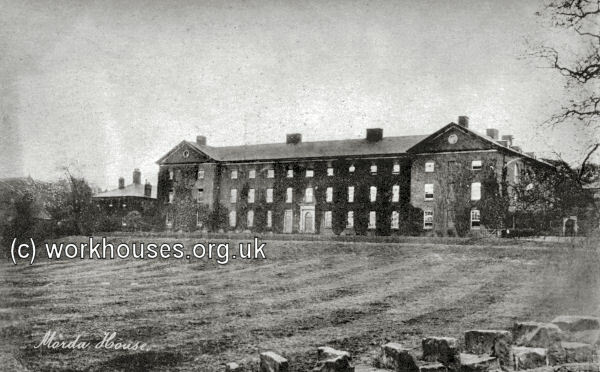 In 1891, a 16-bed isolation hospital was erected to the south-east of the workhouse. It later became the Oswestry and Chirk Isolation Hospital, and then Greenfields Hospital. It now (2001) houses Morda Social Club. Oswestry isolation hospital from the south, 2001. St Anne's Church, the workhouse chapel to the north-east of the main building, and the nurses home to the east of the workhouse, have also been demolished. In January 1888, a new-year amateur theatrical production was held at the workhouse in aid of the boys' band. Shropshire Archives, Castle Gates, Shrewsbury, Shropshire SY1 2AQ. Please note that records may contain gaps or have access restrictions - please check before visiting. Holdings include: Act of Incorporation (1790); Guardians' Minutes (1791-1930); Births (1857-1950); Baptisms (1813-1923); Deaths (1857-1955); Burials (1813-56); Punishment book (1855-1910); Admissions and discharges (1916-25); Register of lunatics (1923-33); Register of mechanical restraint (1892-1935); etc.